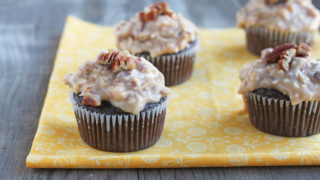 German Chocolate Cupcakes, makes just 4 cupcakes with creamy coconut and pecan frosting. If there’s one cake that the world forgot about, it’s German Chocolate Cake! Why is this? We have to fix it! It’s such a tragedy that the world has seen less chocolate cakes filled with creamy, sweet, coconutty frosting with pecans stirred in. Personally, I can’t live without German chocolate cake, so I know your life must be lacking, too. I made us a small batch of chocolate cupcakes; these are my go-to chocolate cupcakes that just so happen to be egg-free, so if you have egg allergies, you’re in luck! Instead, I rely on the reactions between baking soda and vinegar to provide the lift and fluff in these chocolate cupcakes. 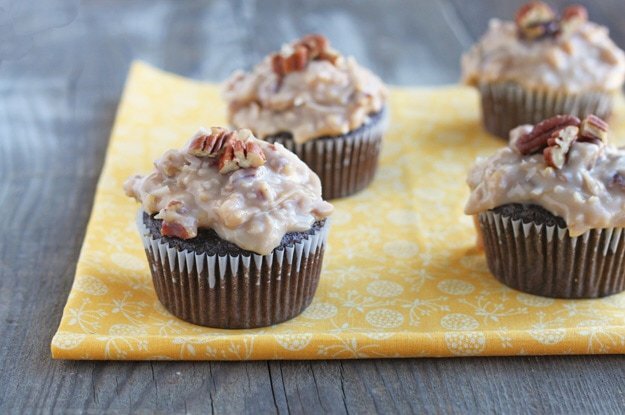 The frosting on these German Chocolate Cupcakes is made with evaporated milk, an egg yolk (oops, stir in cornstarch if you have egg allergies), sugar, butter, coconut and chopped pecans. It’s creamy and perfect for piling on cupcakes! I’ve also doubled this frosting recipe and stuck it between my mini chocolate cake recipe that I first sliced in half. I put a version of that cake in my cookbook Dessert for Two if you need more specifics! I get asked a lot if you can double my recipes, and the truth is, I only test my recipes the way you see written here. However, there are lots of people who do double my recipes frequently (including my Mom), and they report back on their success. This cupcake recipe is reportedly easy to double, which would yield 8 cupcakes for you. Please make these German chocolate cupcakes and make sure the world doesn’t forget about this delicious chocolate cake with creamy, nutty coconut frosting! In another bowl, whisk together the canola oil, vanilla and brown sugar. Add the dry ingredients to the oil and brown sugar mixture in two batches, alternating with the milk mixture. Divide the batter between the 4 muffin cups and bake for 15-18 minutes, or until a toothpick inserted comes out clean. Let cool on a wire rack. Next, make the frosting: in a small saucepan, add the evaporated milk, sugar, egg yolk and butter. Turn the heat to medium low and cook while stirring until mixture starts to simmer around the edges of the pan. Lower the heat slightly, then continue to cook while stirring another 1 minute. Turn off heat, and stir in the pecans and coconut flakes. Pour the mixture into a bowl, let cool to room temperature, then refrigerate until ready to serve the cupcakes. To serve, frost the cupcakes with the chilled frosting. Congratulations, it sounds like it will be an amazing opportunity for you and I’m sure it will be so good to be closer to your family again! Hooray! So happy for you both :) I will definitely be going out there to visit you, Bev, and Cassie and we can all have a wonderful get-together! <3 I love these cupcakes because I know Jason would LOVE these. I think this might be one of his favorite flavors. Good luck with the job hunt! You rock it, girl! These sound delightful! Lovely recipe. These look perfect…my husband’s birthday was yesterday and I made him German Chocolate cupcakes because they’re his favorite!! Now I can make a smaller batch when the craving strikes. Always wanted to make german choc cake, and now I can make it portion controlled! Congrats- sounds like a great opp! Can’t wait til you get here! Well, sort of here. Over there. I mean it’s HERE but not here here. It’s there. But close to here. Congratulations! So happy for you & the Mr. I’m sure the door will open soon for your job. YAY! That if fantastic! You are so talented, I’m sure you will find something right away! PS your mom is too cute. My mom always likes to make corrections or disclaimers on my blog. Congratulations! That is seriously such awesome news. I’m just about to graduate grad school and I’m sitting at home sending out countless number of resumes, which are probably not even being looked at, and it’s been really tough but reading your post has inspired me to keep faith. Hopefully one day, some job will pay for my move and transport my laundry machine with the dirty clothes inside! Exciting news – congrats! And best wishes with your own job search. I love German chocolate cake – your cupcakes look delish! Good luck with the move! Don’t eat too many cheese poofs. Those cupcakes look great!! Texas beckons you!! I’m happy for you guys. I mean, they move FOR you? Wicked cool. Watch out for those movers! They’ll also pack up trash cans full of trash, empty plastic bags, empty shoe boxes, the broiling pan from the oven, drain stopper for the kitchen sink, the wrench for the garbage disposal, packing tape(!). Yes, I know this from personal experience. You can’t know how much I love moving, the whole starting over thing. I envy you! We’ve been wanting to move these past couple of years but still can’t get a handle on it. Good luck! Meanwhile, I’l enjoy the cupcakes. I need to make some chocolate cupcakes. Yay for moving to Kansas! I’m so excited for you guys!! And someone else is packing and moving for you? That is so priceless. Just make sure you bring a batch of these cupcakes with you for me, errr the movers! SO exciting!! You deserve it, congrats! That’s exciting to be closer to family! Awww…so glad that you are finally moving in a southerly direction darlin’. Fingers crossed on the job hunting. I love that they are packing everything for you at least. Fab cupcakes!! i’m so making these, look so good and relatively healthy. so sorry about your job, i’ve been there, but i know in due time you will find something. and change can be positive, it’s all about how you look at it. Congratulations to the Mr. on the new job!! This is exciting!!! congrats! good luck with the new city, it all sounds fabulously exciting. Congratulations on the exciting new change, and good luck with your job hunting! I love these cupcakes… I don’t think I’ve even seen German chocolate cupcakes before, let alone a recipe that allows you to make only 4 – amazing! I hope your move goes well! We move around a lot due to my husband’s job and we are currently in Kansas. I have to admit, we weren’t too thrilled when we found out we were moving here but we actually love the area. I’m not sure where exactly in Kansas you are moving but if you have any questions please let me know, I might be able to help! Welcome to Kansas! If you need anything, you have plenty of readers in the area (including me) who would be happy to help you out. :) PS–the cupcakes look amazing. Can’t wait to try them! OMG – my husband and I are in the middle of deciding if we’re going to move back to the South in the near future. I want to be near family, but am seriously struggling with leaving California. Hopefully I can come around to feeling as confident as you do! Congrats on the move! Its going to be so nice living within driving distance of you family! Congrats and good luck on the job hunt. PS: We had movers *move us entirely* too. It’s so glamorous, you’re gonna LOVE it! PSS: These cupcakes sounds pretty much perfect. I just wanna dive into the frosting gooey glazey layer..YUM! Congrats! That sounds exciting. Where in Kansas did you land? Hubster and I made the moved from Kansas City about a year ago so if you need any restaurant suggestions I’m happy to send some your way. We really love California, but we feel the same way you do, in that we could never really live the way we want to out here. We want to own a house with some land and have kids in a smaller city where they could see their grandparents more than once a year. There’s a lot to gain by moving, but we have some amazing friends here and a pretty nice life, so it feels like we have a lot to lose as well. BTW – where in Kansas are you moving? My husband’s family live in Wichita and it is such a friendly city! That’s my only experience with Kansas but hopefully you will have a similar one! Congrats on the move! go ahead, leave the dishes in the sink and bake some of these cupcakes for the movers. They won’t mind a bit, I’m sure. Happy trails & looking forward to your posts from the heartland. My my these look good. Congratulations! There is nothing better than being close to family…except maybe having someone else deal with the packing nonsense that brings you closer to family :) I think if I was packing your house, I’d be alright with doing a few dishes first if these cupcakes were involved in the payment plan! How exciting, congratulations on the big move! And how nice to have all the packing done for you :-) These look like the perfect celebratory cupcake and I love the crunchy frosting on top. The rewards for making sacrifices and working hard are sweet indeed! Congratulations on heading closer to your loved ones and best wishes on your move, Christina! CONGRATS!!! so excited for your new chapter to begin and your so much closer to your family, that’s HUGE!! sending you prayers.. I am sure you will score a great new job!! Ok, so we all know I don’t actually like chocolate (WHAAAAAAAT), and I’m not normally an overly huge fan of frosting, either (it just keeps getting weirder!!!). That being said: I think I could probably eat this frosting recipe straight from the bowl, no cupcake required. Anything that combines pecans and coconut is worthy of international recognition if you ask me. YAY! What fun news! Congrats, and good luck on the job hunt! Good luck on the move. Congratulations! That’s beyond awesome! Hope you find a job soon. Congrats & Good Luck. Congratulations on the move! I’m sure you’ll both be happy to be closer to family. I die. These look great! I made these last week and they were the best cake/cupcake I have made. I found you through Tasty Kitchen and am now a full-fledged fan. Thanks for doing the hard work and giving us recipes in small proportions! Congratulations on your move to Kansas, it will be nice to be closer to your family! What part of Kansas are you moving to, we are in north central Kansas, about 45 minutes west of Manhattan. Praying you will find a job soon! This was my first D42 recipe and they came out great! The best cupcakes I have ever made. I had to cook the frosting longer but it was perfect and so easy! Thanks. Delicious! I made these this evening! They were the perfect treat for a rainy day. German chocolate cake is my husband’s favorite and it was his birthday last weekend. Instead of making the cupcakes, I doubled the recipe and turned it into a six inch cake. It was perfect! I doubled the icing recipe too, but I probably could have left that as is, though I’m not complaining:-) My husband loved this version and we’ll definitely be making it again. Love your recipes, as always! Thanks, Lindsay! It’s good to know this recipe can be doubled into a mini cake! I’ll keep that in mind! Thank you :) Tell the hubs Happy Birthday for me! Made these for hubby’s birthday. His favorite cake is German Chocolate. He, my mother and I loved these! So very good. They are requesting more already. Thank you so much for sharing such a great recipe. We’ve been trying to reduce the quantities of sweets we eat and this fit the bill perfectly. Thanks for the recipe. Do you know how many ounces I’d use if I wanted to use german chocolate baking bar instead of powder? Thank you so much! Came across your blog while searching for 2 serving chocolate cake, and now I can’t tell you how happy I am in finding ur blog. I like everything that is small and cute and ur blog is so perfect. I came in search of chocolate cake and now I can’t decide which one to try first. Thank you so much for ur recipes . My husband wanted German Chocolate cake for his birthday. I’m dieting, he’s not, so thank you for the solution. The batter tastes good! Cupcakes are in the oven now! Would this recipe work if butter was used instead of canola oil? Ummmmmmmmm..Sweetened condensed milk or evaporated milk for the frosting? It’s evaporated milk, like the recipe states, and you cook it to make it thick. Let me know if you have any other questions. Hey Christina, I’ve made so many of your recipes and they’re all awesome. Thanks so much for your terrific blog! I wanted to ask about brown sugar. Packed, lightly packed, not packed? Seems we all measure it differently. Also, does light or dark brown make a difference for the purposes of this recipe? Thanks agin!